I will never be able to eat a Canadian dessert ever again. Not after stuffing my face with the amazingly decorated, gourmet pastries from Paris. I guess I can try to scarf down the occasional half a dozen cupcakes here and there, but it just won’t be the same. Not after two trips to Ladurée, arguably Paris’ most famous bakery chain. This wasn’t just any old bakery, so don’t even start shaking your head at me. Ladurée invented the macaron, those tiny, round double-decker desserts you see, with a cookie top/bottom and a creamy ganache filling in the middle. They are like nothing you’ve ever had before – delicate (the cookie shell can be broken with the least bit of effort), yet somehow satisfyingly filling. Could be the ground almonds baked into them. Who knows. Anyways, since I like the Canadian version of these desserts, I knew I was bound to simply adore the Parisian version. Sidenote: please do not confused macarons with macaroons. I too once confused these two desserts (before Brittany set me straight). The latter often contains coconut, which I am not a fan of one bit. But back to Ladurée. When I spoke with my Parisian baker friend, he recommended that I go to the original Ladurée location, found at 16 rue Royale, just a short walk from the Place de la Concorde in front of the Tuileries (Louvre gardens). My first, overly-excited trip to the café took place last Saturday when my old roommate Natalie came to visit me in Paris. You can see details of that trip as well as pictures of the pastries that we ate in this post. Yesterday, I took my second trip to my new favourite place. Even though I had eaten five out of the six macarons that Natalie and I had bought (chocolate, vanilla, raspberry, salted caramel and lemon), I wanted more. There are more than a dozen different flavours of macarons, some seasonal and some permanent. I bought four more: a strawberry mint, orange blossom, rose and chuao chocolate. They were just as delicious as my five other ones. Since it was not enough for me to just get (seriously) overpriced macarons, I also needed to buy another pastry. 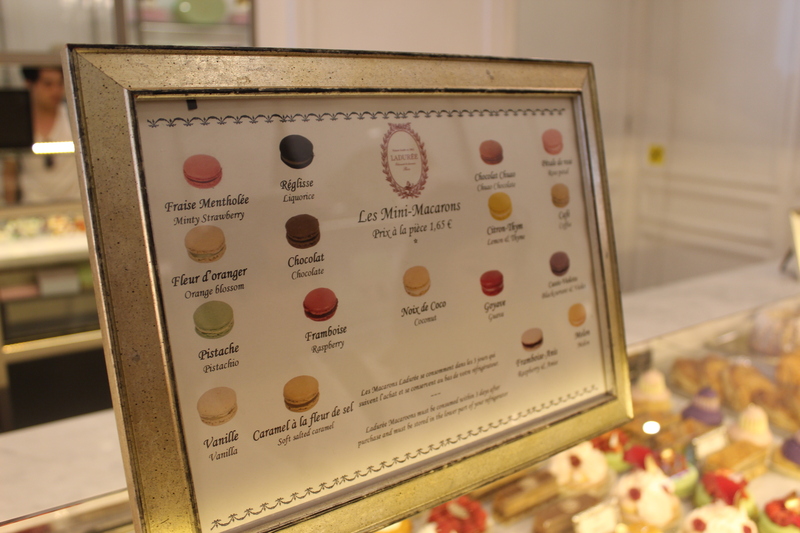 I chose one that I saw someone eating when Natalie and I were in the Ladurée tea salon. It was a rose Ladurée Religieuse, which in English, non-fancy talk, is basically a decadently iced pastry with a rose whipped cream and fresh raspberry centre. It was delicious and messy, but probably the best thing I’ve ever eaten in my life. Before my pastry picnic occurred I, of course, needed to have a mini photo shoot with all my dessert. I sat myself down on a shaded park bench across from the Concorde’s obelisk and snapped away. After dessert, I wandered about the city, Ladurée bag in hand. I couldn’t just throw it out anywhere, after all. I felt like it was a sacred token of my time spent in Paris. Instead, it was disposed of just a few steps away from Napoleon’s grave. An appropriate burial for such gourmet wrappings. There’s a Ladurée shop in the Charles de Gaulle airport, where I’m heading tonight. Oh god. PS: non-edited pictures courtesy of my actual camera. Thank you to Natalie’s computer and its uploading abilities. PPS: gotta run and catch my train! Don’t mind of zero edited grammar/spelling. Yikes. I’m going to Laduree for sure–can’t wait!